The Faucet Glove™ The ultimate handheld bathtub faucet sprayer! 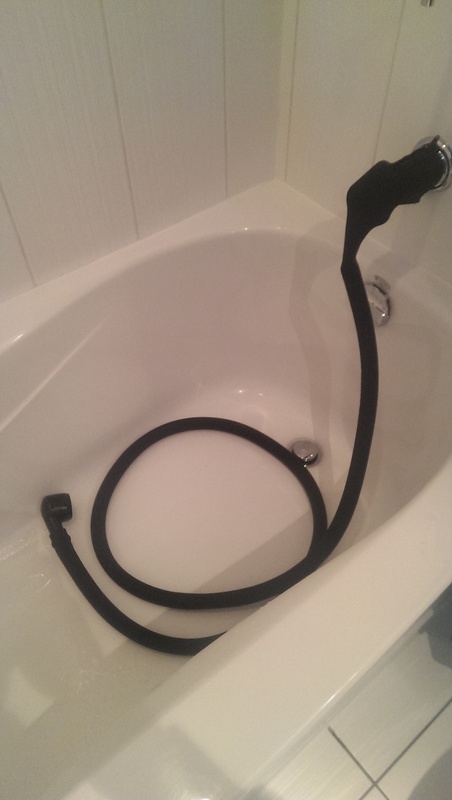 Finally, a bathtub faucet sprayer attachment that actually fits right AND works great! Introducing The Faucet Glove™ A fantastic new bathtub faucet sprayer attachment that will forever change the way you wash your pet in the bathtub! Designed to fit over the entire faucet and being made of neoprene, it fits like a glove! The Faucet Glove™ is easy to use with a round handheld sprayer at the end of a permanently attached, 6' hose providing plenty of water pressure! The Faucet Glove™ easily slips over and form fits the entire faucet. A velcro cinch strap is used to grip the faucet above the outlet to help prevent leaking and after use, simply undo cinch strap, remove from faucet and hang to let dry before storing. The picture shown above is the first prototype made showing The Faucet Glove™ attached to a non standard squared type faucet for testing! Feel free to click on it to view full size image. We will also have a flexible rubber brush attachment made that will provide a more thorough and therapeutic grooming experience. The brush attachment will further help to rinse away soap, dander and loose hair plus will provide a stimulating massage that pet and person will enjoy! The Faucet Glove™ is in the final design phases and we are hoping to be ready for consumer purchase by the end of summer 2018! Reserve price is only $19.95 + $4.95 s&h and we will email all reserve customers when The Faucet Glove™ is ready for ordering. Take care, be well and in the words of Yoda, Jedi Master, "If you share the news of The Faucet Glove™ with others, find you, good fortune will!